Here is my card this week for the challenge over on 2sketches4you. I just love doing these challenges with the sketches that Kazan and Laura create every week. I feel that it has helped me to be more creative in making my cards. For my card this week, I used Stampin Up for the cardstock, stamps, ink, and ribbon; Provo Craft for the patterned paper; Ranger Ink's Stickles for the glitter; and the Threading Water punch by Fiskars. Ooooh...this is so pretty! 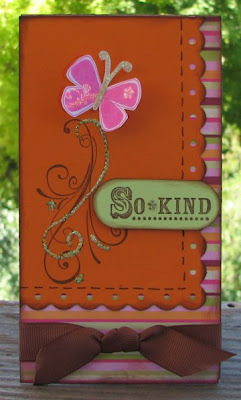 I just love how you did the flourishes as the butterfly twirly! SO pretty! Great job with the sketch!